The color printing and book-making company adds versatility and value to their wide range of finishing options. New cover options and spiral binding colors are live at DocuCopies.com. Differentiating our services by offering more custom options is a strength where our customers put a lot of value. Frosted Poly Covers - durable translucent plastic covers with a frosted, textured finish for spiral, comb and wire-o books. Used commonly with reports, presentations and other business-oriented print jobs. "Presenting more options with binding styles and materials opens our services up to new dimensions of the book-making market, where just a few new customers can generate a lot of business very quickly," says Vice President Jeff Corbo. "Differentiating our services by offering more custom options is a strength where our customers put a lot of value." 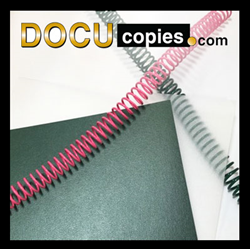 For more information on these new spiral binding colors and book cover options, visit them online at http://www.DocuCopies.com.